Hillary Clinton has a message for Facebook: the company needs to "own up" to its role in spreading Russian propaganda during the 2016 presidential campaign. "They have a long way to go before they get to where they need to be, in my opinion," Clinton said on "The Rachel Maddow Show" on Thursday. Clinton's remarks, made during an extensive book tour, were her most pointed criticisms of Facebook to date. She said her critique applies to "other tech companies," too, but did not name any others. "We now know that they were sowing discord during the election with phony groups on Facebook. They were running anti-immigrant, anti-me, anti-Hillary Clinton demonstrations," she said. This seemed to be a reference to recent reporting by The Daily Beast that "Russian operatives hiding behind false identities used Facebook's event-management tool to remotely organize and promote political protests in the U.S., including an August 2016 anti-immigrant, anti-Muslim rally in Idaho." News outlets have described other U.S. protests that may have been aided by online organizers with Russian links. These events did not amount to much. But the various uses of Facebook by Russian trolls and propagandists is one area of interest to the U.S. officials who are probing Russian interference in the election. "They were, you know, putting out all this 'fake news,' all these negative stories that were untrue, to, really, divide people," Clinton continued. Facebook declined to comment on Clinton's remarks. Clinton asserted that U.S. government investigations and corporate "transparency" are necessary. "Look, we may have our disagreements among Americans," she said on Maddow's show, but "we're not going to let the Russians come in and divide us. And so we're going to make Facebook own up to everything. They've just begun to own up." Clinton indicated that she will remain engaged on the issue. "We're going to go after these provocateurs, these Russians posing as Americans, these content farms in Macedonia, these thousands [of] trolls, these tens of thousands of bots," she said. "We have every right to have a vigorous debate in America, but we don't want it being interfered with and suborned by Putin and his allies." 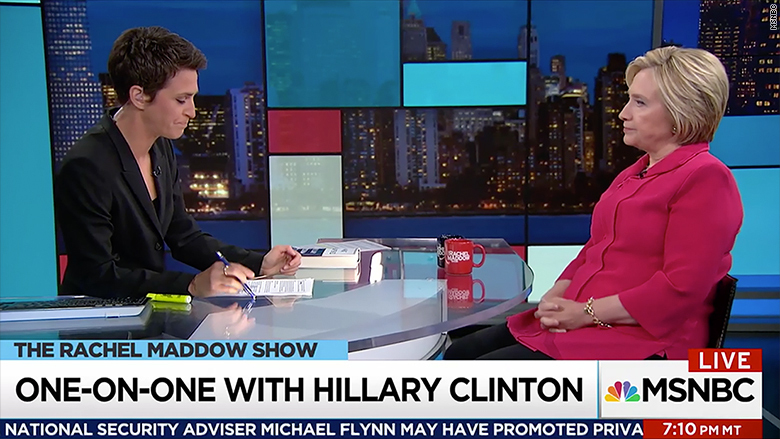 After the interview, Maddow said that she was struck by Clinton's remarks about Facebook. Earlier in the week, Clinton also brought up Facebook during an interview on the "Pod Save America" podcast. "We have to make sure that the playing field is level" for Democratic candidates, Clinton said. "I mean, what we're finding out about Facebook, the largest site for news in the world, means we gotta figure out how that won't work to our disadvantage."